It’s not as straightforward as you would think. In the ‘70s and ‘80s, an entire generation of children were known as “latchkey kids,” called as such because, entrusted with their own set of keys, they would regularly return from school and remain home alone until parents returned from work. These days, two-parent households where both parents work full-time make up 46 percent of the population, compared to 31 percent in 1970. There is also "evidence that American children are safer than ever," according to a study from the University of California, Irvine. Yet, the concept of leaving children home alone has become truly controversial. National headlines blare cases of mothers being arrested for leaving children of various ages unsupervised. In December 2018, a mother named Taylor Cumings was arrested for neglect of a dependent after leaving her 4- and 7-year-old sons on their own while she went to work. In October 2018, Danielle Lena Pearson was arrested after she left her three children—aged between six months and 4 years—inside the house by themselves for more than two hours. And back in 2016, a mom named Susan Terrillion was arrested for leaving her 8- and 9-year-old children alone at a vacation rental home while she ran out for 45 minutes to pick up food. The three states currently with laws regarding a minimum age for leaving a child unsupervised at home are Illinois, Oregon and Maryland, according to the U.S. Department of Health and Human Services’ Child Welfare Information Gateway. Here are those laws and the 47 other states’ guidelines/recommendations (in alphabetical order by state) on leaving your child home alone. Arkansas does not have a legal limit on the age at which a child can be left home alone. Some public schools have rules about what age they’ll allow a kid to get off the bus without an adult present, and for many, that age is 9 and up, according to the University of Arkansas. 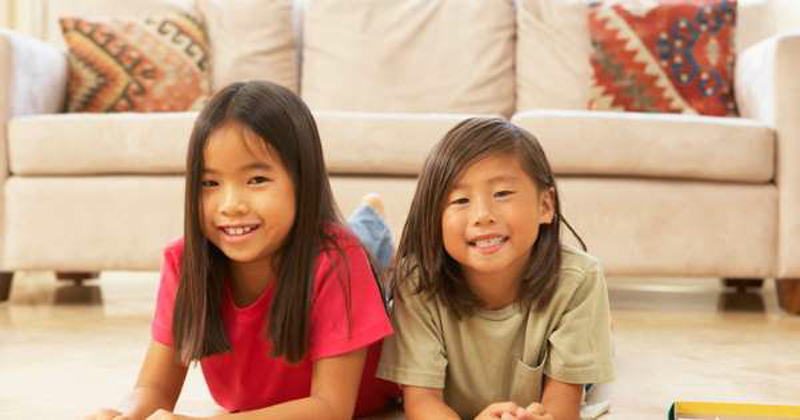 Additionally, there are no regulations about leaving children in charge of siblings or others; however, it is not advised that an infant or toddler be left in the care of a sibling under the age of 13. No age is specified by California law, but the state offers a checklist of questions for parents to go through before determining if their child is ready. Colorado has a guideline around the age at which it might be appropriate for a child to be left alone for short periods of time, and that’s 12. The state doesn’t have a law or guideline, but the Florida Department of Children and Families cites the National SAFE Kids recommendation of 12 and offers a checklist of questions. No definitive law or guideline exists in Hawaii; however, the state cites the American Academy of Pediatrics' recommendation that adults supervise children until about the age of 11 or 12. Idaho lacks a specific law, guideline or mention of the issue on government websites. Kentucky There is no law or guideline in Kentucky. According to WeHaveKids.com, the state’s Child Protective Services has stated that if you leave a child under the age of 11 you may be investigated for child neglect. Louisiana The state doesn’t have a law or guideline on a minimum age at which a child can be left home alone. “However, if a child is left alone and there is an incident, courts will typically assess the situation based on the following factors: The child’s maturity level; the safety of the child and his or her surroundings; how long the child was left alone; and the parents’ concern for the child’s overall welfare, and the steps taken to ensure their safety and well-being,” explains Taetrece Harrison, Esq., a family lawyer in New Orleans. Maine does not specify an age at which a child can be left home alone, leaving the choice up to parents’ and guardians’ discretion. One of the three states to have a law on the books, Maryland requires that no child be left alone under any circumstances if the child is under the age of 8. It does say that a 13-year-old may babysit a child under the age of 8. A person who violates this law is guilty of a misdemeanor and upon conviction is subject to a fine not exceeding $500 and/or imprisonment not exceeding 30 days. Massachusetts doesn't set a specific age at which a child can be left home alone. In the state, such issues are decided on a case-by-case basis. In Michigan, there is no legal age that a child can be left home alone, according to the Child Protection Law. It is determined on a case-by-case basis, but the state explains that as a general rule, a child 10 years old and younger is not responsible enough to be left home alone. A child over the age of 10 and under the age of 12 will be evaluated, but the case may not always be assigned for a CPS investigation. State law does not specify an age at which a child can be left home alone or under the care of another child, leaving it up to individual counties to come up with their own guidelines. As a general rule of thumb, Child Care Aware, an agency in Minnesota that helps families across the state find quality child care, states that counties in Minnesota tend to recommend that children younger than 12 not be left home alone. According to the Missouri Department of Social Services, statutes do not provide a legal age restriction. That said, they note that the Children’s Division Abuse/Neglect Hotline takes reports of a child under age 8 left alone, with a face-to-face safety check held within three hours. Nevada has no set guideline or law. According to The Las Vegas Review-Journal, state law leaves the decision up to the parents’ discretion, and the mindset or maturity of the child is taken into consideration, as is the home being fit for a child (that is, clean, stocked with food, and air-conditioned or heated). The state doesn’t have their own law or guidelines, leaving it up to each city or county to decide. For instance, in Albuquerque the minimum age for a child to be left alone is 11. While North Carolina has no set law or guideline, the state's fire code G.S. 14-318 explains that if you leave a child under the age of 8 alone without supervision, this is a fire hazard and you will be found guilty of a Class 1 misdemeanor. North Dakota does not have a set law, but guidelines from ParentsLead.org—a collaboration among the ND Department of Human Services, ND Department of Transportation, and ND University System—state that “children who are 9 years old should NOT be left unsupervised for periods greater than two hours during the daytime. Children who are 10-11 years old … may be left alone for longer periods of time. However, caution is advised in leaving a child unsupervised during sleeping hours." Although in 2016, Rhode Island lawmakers proposed “legislation to ban kids under 10 from being home alone and older kids from being home alone at night,” there is currently no law or guideline. The state leaves this decision up to parents and guardians. The Texas Department of Family and Protective Services site explains, “Texas law doesn't say what age is old enough for a child to stay at home alone. However, adequate supervision is critical to keeping kids safe. An adult caregiver is accountable for the child's care and inadequate supervision can be a type of neglect (neglectful supervision).” They ask parents to consider a variety of factors, such as a child’s emotional maturity and hazards and risks in the neighborhood, when deciding whether or not to leave a child home alone. The state doesn’t have a law or guideline regarding the minimum age at which a child can be left home alone, leaving it up to parents’ or guardians’ discretion. Given how nebulous (or, in some cases, downright nonexistent) the guidelines are in most states, parents who are concerned should follow recommendations and guidelines from their local courts and implement these into their own decision process, Esqueda advises. “This is a great resource for parents to turn to,” she shares. “This will also provide the added peace of mind that they have done everything the court will require them to do in case their decision was ever brought into question.” If you’re having trouble tracking that information down, “the most direct way to get information is to call up the CPS local agency and ask them directly for guidance,” she says. Role-playing is another great tool for parents. Not only will this help the child think through scenarios, but it can also serve as a resource for kids to fall back on if they are ever faced with the same situation.